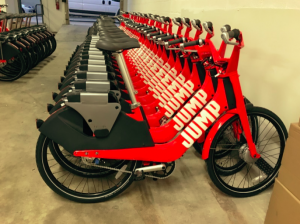 JUMP, the dockless e-bike service, is doubling its fleet in DC Thursday. Actually, though, thinking of JUMP as bikeshare misses what it truly is and what it’s competing with. We all have a mental image of the world around us and how we get there. There’s the places we’d generally walk to; the places we know we have to drive to; the places we usually take Metro or a bus to. If we are comfortable cycling, there’s the places we know we bike to. Maybe there’s places (and times and conditions) when we’d usually take a ride hailing service like Uber or Lyft. That’s because riding a JUMP isn’t like riding a bike. You float up hills. You shoot past most other cyclists. You effortlessly keep up with cars on neighborhood streets. You can do this thanks to an electric motor that kicks in as you pedal and can power the bike to a maximum of 20 mph.